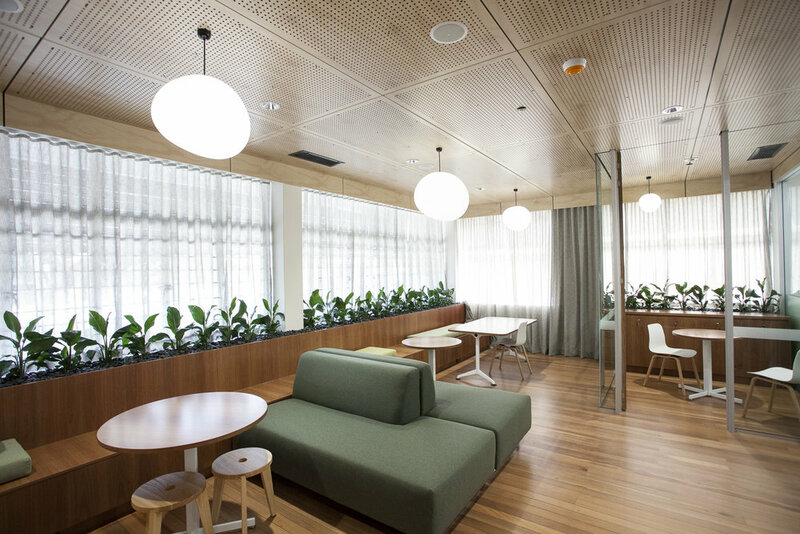 Wilson Architects were engaged by Brisbane Girls Grammar School to refurbish staff workspaces within the iconic ‘Bread House’, formerly the National Baking Industry Association building. Bread House is situated on Gregory Terrace, Spring Hill, overlooking the main school campus and houses the BGGS Departments of Finance and Communications & Community Engagement. As the staff are located away from the campus proper, it was important for the building and its occupants to have a sense of connection and engagement with the school. Views back to the school are prioritised for the building’s primary users and front of house ‘public’ interaction spaces allow staff to remain connected to the campus. Biophilia is defined as the inherent human inclination to affiliate with nature. Biophilic design, an extension of biophilia, incorporates natural materials, natural light, vegetation, nature views and other experiences of the natural world into the modern built environment. Biophilic design replicates experiences of nature in design to reinforce this connection and is reliant upon evidence-based research into design methods that support improved health and wellbeing. The design response incorporated into Bread House includes maximising access to natural light and views, the use of natural materials such as timber and indoor planting which foster a sense of wellbeing and optimism within the workplace. As a main interface with parents and school staff, it was important for the interaction spaces to feel generous, welcoming and inviting, whilst providing good acoustics and security. The foyer provides a lounge and flexible meeting or presentation space, as well as private meeting rooms to allow acoustic separation as required. Staff open plan workspaces are located against glass to maximise quality of space through outlook and natural light, with a variety of Activity Based Workspaces for focussed and collaborative working. Breakout and interaction spaces adjoin the kitchenette and rear deck with city views. This project reflects the quality and position of Brisbane Girls Grammar School as a leading, innovative and pioneering education institution. It fosters a sense of physical, emotional and symbolic connection for staff and visitors providing connectedness and engagement with the campus communities of staff, students and their families.